Infographic: Is AI Beating Humanity at Its Own Game? AI and robotics are better than humans — at certain tasks. This infographic looks at the debate around automation and why people shouldn’t fear it. From software on our phones such as Apple’s Siri to virtual assistants like Google Home, artificial intelligence is steadily becoming a part of our everyday lives. However, some of the news media steadily publishes headlines claiming that AI and robotics will take over our jobs — and perhaps the world. Is there cause for alarm? With the steady drumbeat of warnings about automation, it’s difficult to separate fact from fiction. That’s why a new infographic, entitled “Rise of the Machines,” aims to set the record straight and stop us from panicking. Yes, it’s true that automation can beat humanity at its own game, but it’s often to our advantage rather than our detriment. Technology and industry experts often note that machines are typically good (and possibly better than humans) at only one thing at a time, unlike how they’re often depicted in science fiction. Sure, a robot can turn a screwdriver or an algorithm can identify a part flaw, but they can’t also make coffee or open a door. 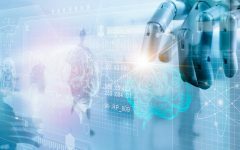 Using AI can eliminate human error. Critics argue that machine intelligence lacks the creativity and compassion which separates us from machines. However, this is partly because general AI – the type of artificial intelligence that can use its past experience to complete new tasks – is currently out of reach. If it’s ever fully created, general intelligence would supposedly be able to adapt, just like the human brain.